After the meth cooking process has stopped, most of the hazards decrease. 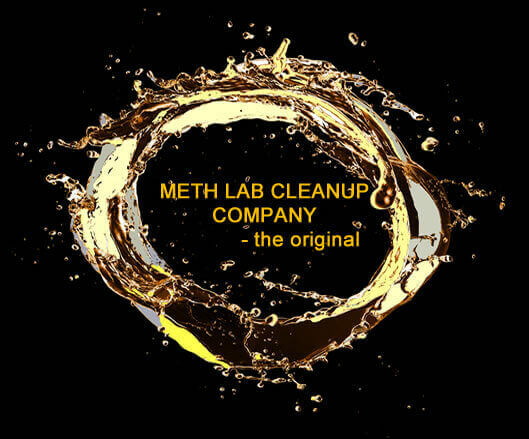 However, some residual contamination created from repeated "cooks" can persist long after all production has ceased causing meth lab health concerns. These residual chemicals can be volatilized or aerosolized during the cooking process and deposited on surfaces and materials. Airborne contaminants are absorbed into soft materials including rugs, furniture, drapes, walls and other surfaces and my also contaminate the heating, ventilation and air conditioning (HVAC) system of the structure. 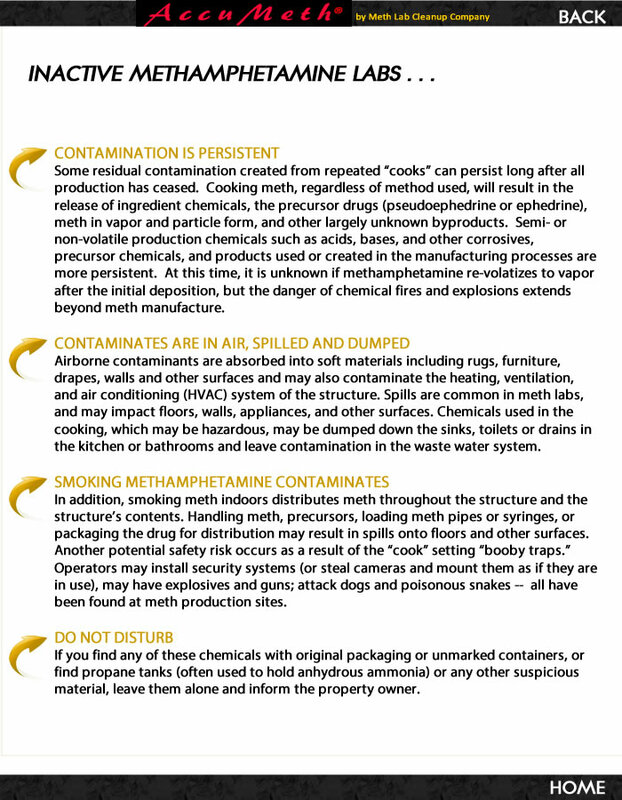 Spills are common in meth labs and my impact floors, walls, appliances and other surfaces. 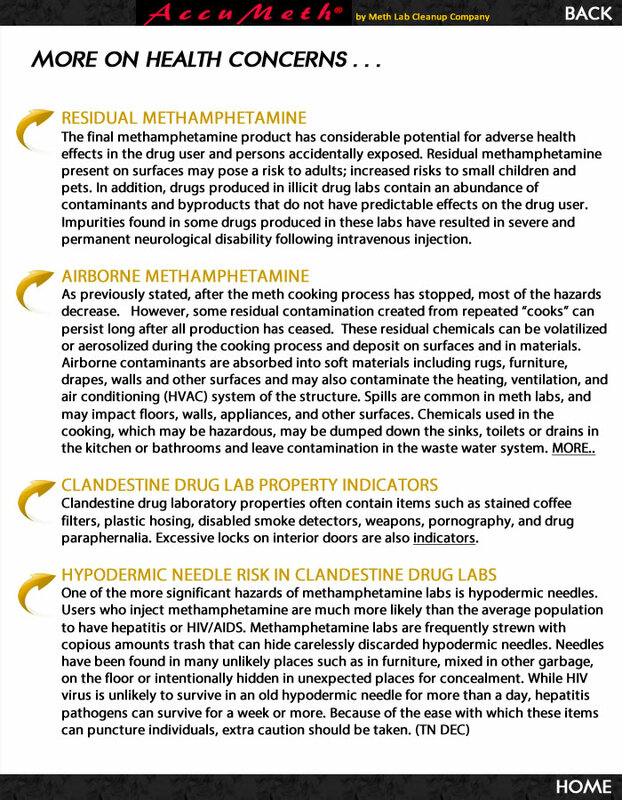 Clandestine drug lab dangers include chemicals used in the cooking, which may be hazardous, may be dumped down the sinks, toilets or drains in the kitchen or bathrooms and leave contamination in the waste water system. For additional information, see the fact sheets on active and inactive labs. Chemicals may enter the body bey being breathed, eaten, injected (by a contaminated needle or accidental skin puncture) or absorbed through the skin. Both acute (short term) and chronic (long term) health hazards may result from the exposure to residual contaminates. Acute exposure hazards come from direct contact with product or waste and inhalation of product or wastes. Burns, tissue irritation and rashes may result from chemical spills and ski contact. Headaches, dizziness, nausea, and other health effects may result from inhalation of vapors. Chronic exposure is contact with a substance over a long period of time (over 1 year). 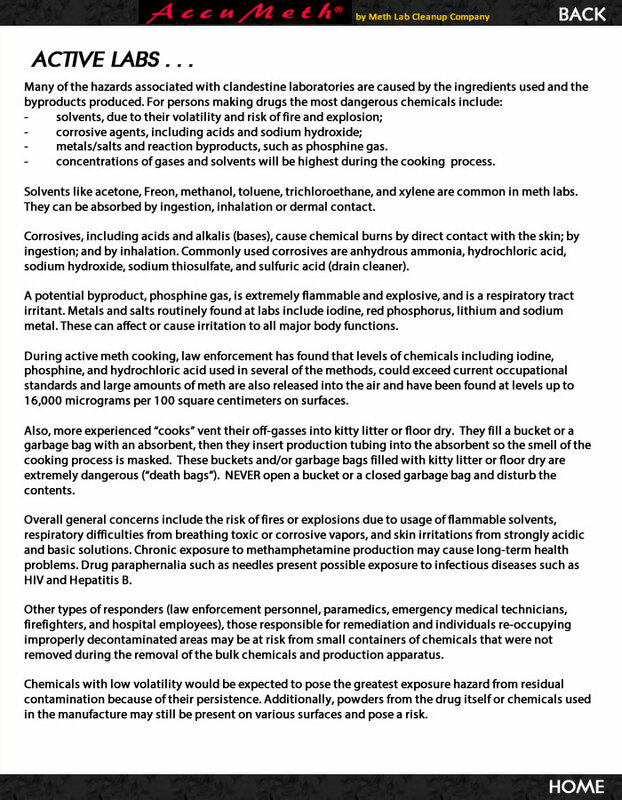 Some chemicals used in methamphetamine production present a danger of injury from fire or explosion. In addition, at the lab site there are possible risks of exposure to infectious diseases (e.g. HIV, hepatitis B) in the event of skin puncture by drug paraphernalia. Inhalation and/or skin exposure (absorption) are the most likely routes of exposure for persons entering the drug lab environment. There is the potential of toxicity from all routes of exposure to the chemicals in a drug lab; i.e., ingestion and injection of the drug, absorption of chemicals spilled onto the skin, adsorption of chemicals deposited onto the ski from vapors and inhalation of vapors. Due to their continuing brain development and special developmental behaviors (such as crawling on the floor and placing objects in their mouths), infants and young children may be at a greater health risk from exposure to chemicals and drugs in methamphetamine laboratories. Inhalation or skin exposure may result in injury from corrosive substances with symptoms ranging from respiratory symptoms of shortness of breath, cough and chest pain, to burns of the skin. Many solvents are absorbed into the body through the lungs and, if the dose is sufficient, may cause neurological symptoms such as intoxication, dizziness, lack of coordination, disorientation and nausea. The skin, to a lessor extent, may also absorb some solvents if chemicals remain in direct contact,. Ingestion of chemicals will results in the greatest risk of toxicity. A child may accidentally ingest these chemicals, if residual chemical is present on surfaces.